Bangalore Past Event Snap shot's & Ride details - GGI-Group size: 4000+ Professionals, Increasing on day to day basis, Come & join us 2 serve Mother Nature. 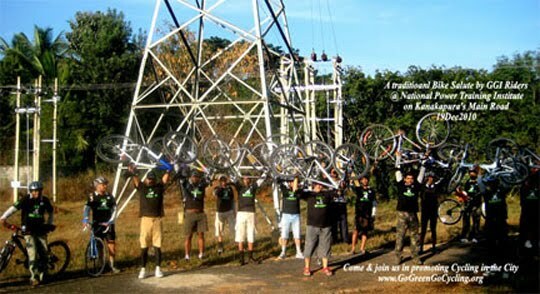 Dec23, GoGreen Christmas Special ride . 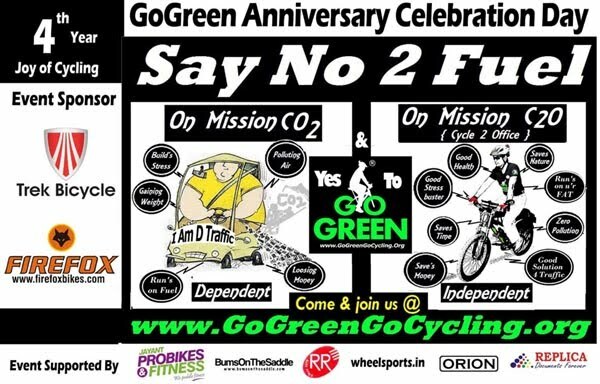 16Dec12, GoGreen 4th Anniversary celebrations & Mega Campaign ride. 09Dec12, GoGreen Endurance ride towards Malleshwaram. 02Dec12, GoGreen Endurance ride towards Tataguni estates. We planned to meet near Sobha tulip, 24th Main.J.P Nagar 5th phase @ 6:30am. The first GGI group that arrived was Madhu & Anand team from BSK-III stage later joined by Shantu & Gautam team from Malleshwaram & finally Yusuf & team from JP Nagar . We were 22 GGI's started off by 6:45am. We went through Brigade MM road, Chunchaghatta Main road, Silver Oak trees road - Kanakapura main road - crossing Nice road then take 1st right - Tataguni estate - Jyothy Institute of technology - BGS International School - Kumbalgodu - Mysore road - Kengeri - Right on the main road towards Utharahalli road - BGS Hospital - JSSate - Srinivaspura cross - Utharahalli Circle - We reached our destination by 8:00am and then started towards Mysore road for more pls click here 4 more snaps..
were waiting. This time we had decided to have a group photo before the start of the ride so that we don't miss out after the ride. The Scheduled ride was supposed to be started off @ 7:00am but later on came to know that it was planned to start off by 7:30am. The event was flag off by Shri K.R Srinivasa, IAS,Commissioner of transport and road safety, Bangalore,around 100+ riders participated the event. 10 km was the ride distance. for more pls click here..
21Nov12, GoGreen Group shooting a video for Suvarna 24x7's "Wheels on Road" show. 30Sep12, GoGreen Endurance Ride towards Gunda Anjanaya temple, Netagera..
20Sep12, GoGreen's special ride "SAy No 2 Fuel" on Bharath Bandh..
GoGreen team set about in the morning to join the ‘Save Turahalli’ campaign. We decided to take a detour and go around the forest, and enter it through the farther entrance. As we moved into the forest on the ‘kachcha’ path, we came across people walking leisurely through the forest, some with high-end cameras, hoping to snap some unique pictures. Then a guy, supposedly a forest officer, chased us on his mobike and told us to get out of the forest as a cheetah had been spotted. Wow! A cheetah! Finally, the forest is living upto its name! GoGreen Rao joined us and immediately rubbished the officers claim, querying him about the people walking about, if they were immune to the cheetah’s ire. Or, maybe, Turahalli cheetah has a special dislike to cyclists for more pls click this link..
25Aug12..GoGreen's Endurance ride towards Mysore..
15Aug12, GoGreen's Special Independence day Ride..
A Special ride on a special day was attended by 54 GGI Cyclist. started @ 7:00am from JP Nagar 5th phase went all along through Jaynagar 4th Block then Southend circle , Sajjanrao Circle, Minerva Circle, JC Road then reached Cubbon Park Central library by 7:40am where other group members were eagerly waiting to join.. for more details pls click on this link ..
V started d ride @ 6-15am, totally 18 GGI's participated in dis month's GoGreen Endurance ride. From JP nagar v were 12 members rest all joined on d way. We had decided to take 100Ft ring rd but d movement v reached kankapura signal v opted to take Utrahalli road & reach Mysore road, the same was communicated to Harish Mane who along with 5 more GGI's were waiting @ kathreguppa Circle asked them to join us @ which was on d way to Uthrahalli. 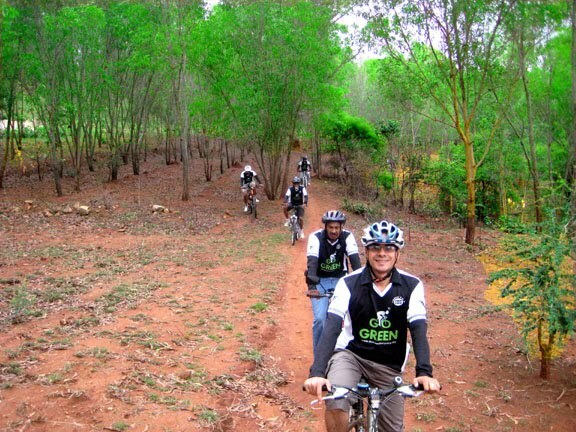 22July2012 GoGreen ride towards Turahalli forest.. Though v thought v will start @ 6-45am as announced on our event list but Started by 7:00am, The delay was mainly due to confusion on d starting point as normally we start from RIS junction & for this event we chose Sobha Tulip apartments which is located on 24th Main road, JP nagar 5th phase. & Srikanth's Residence @ Utharahalli. Since Omkar hills is Situated @ 2,800 ft above sea level hence the steep was almost more than 45degre, which can be climbed by d cyclist if he is prepared to do it right from d beginning. There was not enough space for 2 r 3 cyclist to peddle together as the entire stretch is of loose red soil covered with lot of pot holes & uneven surface, Pls click here for more snaps..
22April2012, GoGreen Earthday Special ride . 18Mar2012 GoGreen Campaign ride towards Thurahalli Forest to support BBCH Race..
Arround 35GGI's started of on 26feb2012 towards Pyrimid Valley as a part of GoGreen Endurance ride which started from Kanakapura junction by 6:30am. its an 40km + 40km ride with most of downhill's while going but while coming back was a real challenge for few of them. GoGreen's & BBMP's Polio Awareness Ride 12Feb2012..
GoGreen's Campaign ride towards Koramangala 05Feb2012. We had 4 teenage school going children s along with their parents @ the starting point, who were checking about the expected distance that we would cover and approximate returning timing.. After enquiring about couple of more details they got the confidence about the group and felt their kids would be safe with the group.. Started GoGreen Ride from Apple I-Store @ 6:55am & reached Cubbon Park central library by 7:30am where other GGI's were waiting. It was long time that we had not Cycled towards Koramangala hence chose & started off by 8:00am. On 22 Jan 2012 , GoGreen team had decided to bid farewell 2 bangalore's one of the oldest Historical Theater by name Elgin in Shivajinagar, This theater was built in 1896, that means 110 yrs old and is now giving his way to new conventional Hall. 28 GGI's participated for this special ride. Starting from Cubbon Park @ 7:45am reached Elgin theater through MG Rd - Commercial Street, inside route of Shivajinagar's Market & finally ended up @ Elgin theater. Click on this link for Snaps & more details..
On 08Jan2012 we all decided to start our GoGreen's new year ride by going to Chilka Tirupathi hence shifted our endurance ride from the last month of the day to starting month. 29 GGI's started from RIS junction @ 6:10am & stopped @ central meeting point for other GGI's to join.. Finally started @ 6:50 am. Since we were in more no's hence Police stopped near by & were checking if we are holding a protest but after know the fact he was very happy about our initiative and wished us success in our mission. 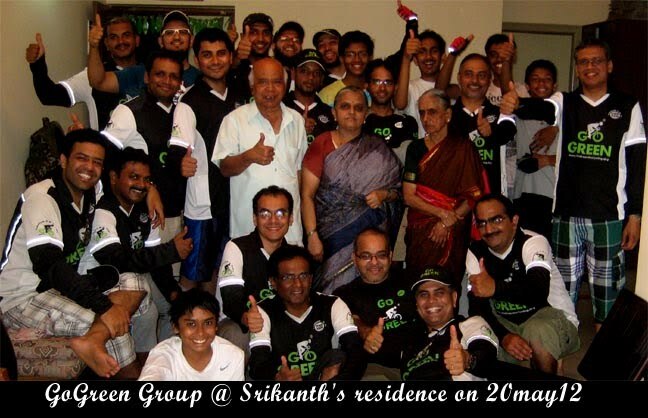 pls click this link for snaps and more ..
On 25 Dec 2011, GoGreen Participated in Scott's Bike launch ride. around 68 GGI's registered which was hosted by Probike of Scott Bikes in collaboration with Orion Motors opp to : Forum Mall of Dairy Circle Road... Most of us from South gathered @ RIS-Junction by 6am and started towards forum mall. Were on time. The best part of this ride was a lucky dip where Scott Aspect-50 costing around 25k was @ stake. Since we had registered on the internet through our GGI-Form hence we were asked to sign 1 more additional form. Were waiting for all other participants. Finally the ride started @ 7:30am flagged off by Mr.Jaymin Sha, Country manager of Probikes & Mr.Uday, Owner of Orion. 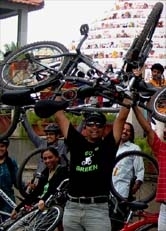 wearing GoGreen T-Shirts & Jersey’s carrying message about awareness to save our environment. The awareness campaign is flagged of by our senior GGI Member Janardhan Sir aged 79, The ride started from freedom Park & end at the start place. click this link for more snaps..
24Sep2011, GoGreen's Cycle Rally 4 supporting ..
into motion—marching, biking, skating—calling for the world to go beyond fossil fuels. At over 2000 events in 175+ countries, we're letting leaders know that a movement is rising to move our planet forward to a clean energy future. arranged A Special Ride 2 spread message 2 END POLIO..
organized on 18Sep2011. Started from RIS junction by 8am touched jaynagar 4th blk by 8-15am since v had published 8-30am @ 4th blk hence Timm's opted 2 stay back & rest moved forward 2 d venue. B'lore Metror had arranged T-shirt with GoGreen logo @ the front side & End-Polio msg on d back. According to our orginal plan v were suppose 2 finish our rally by 9-30 than hv B/fast but d flag off was taking time. To save some time we quickly changed our plan then opted 2 have B/fast than start d rally. Within 20Minutes every one us, finished breakfast then came back 2 starting place. Pls Click on this link for snaps. On 04Sep2011, 40 GoGreen members along with Physically challanged students from various school participated in a specially Cycle rally organised by GoGreen & FACD. This rally was organised 1 day prior to Teachers Day to showcase their gratitude to all the Teachers who have taken 1 extra step to teach us. The ride started @ Cubbon Park's Balbhavan @ 9:00am and was flagged of by Olympian & Arjuna Award winner Nisha Millet. for more snaps pls click on this link..
30 GGI's Started from Merida Junction on 28 Aug 11 by 6:00am, While going from Bangalore to Harohalli, its total down hill ride and the same time while coming back, most of the times its a uphill ride.. Though this was a downhill Pls Click on this link for snaps..
Around 147 GGI's registered for this event on 21Aug11, B'lore south GGI's started from RIS junction @ 7:00am We had requested other GGI's to meet @ Hight court Central by 7:30am. We touched Cubbon Park central library by 7:20am and then moved onto the actual Venue. Totally there were 375 & more GoGreen members along with school children’s that were present on our GoGreen Independence Ride supported & Sponsored by Water Stone company. The ride was flagged off @ 9:30am from Water Stone Company and ended by 10:45am. This day's ride was very special as most of the people on the roadside were shouting "Vande Mataram" Slogans along with us. 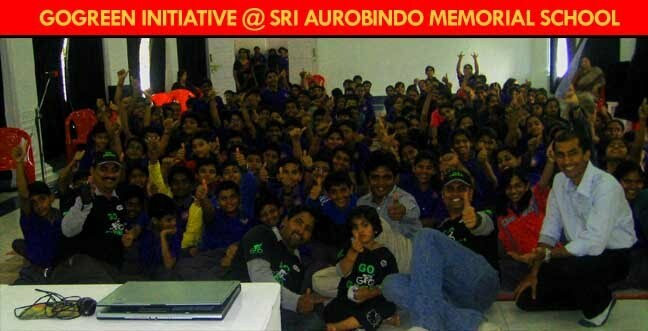 Their was a special invite from Sri Aurobindo School located @ Banshankari 2nd stage. 31 jul 11, 27 GGI's started off to Big Banyan tree, The South GGI's had decided to meetup @ Wheel sports junction by 5:30am & started ride @ 5:45am. Took the ring road via DewaGowda Petrol bunk & hit the Mysore road junction, their after took left towards Rajarajeshwari Arch. This was our 1st pit stop reached 5 minutes early than the set 6:30am. Few other GGI's from other places too joined us. Their was a small confusion with the route as we had set the 2nd Pit stop @ Pepsi factory which was 1 Km ahead of our actual location. We all waited for a long time than realized to turn back and head towards our destination..for snaps and more pls click this link. 17jul2011, A group of GGI, Started from RIS junction by 6:45am, decided to hit Banaswadi & Kammanahalli, It was a pleasant morning with a dusky cloud covered skies met at our Cubbon Park Central library where other GGI's from different places joined, after couple of round's we started of our campaign ride. On the way we stopped @ ITC factory and took couple of snaps their after we stopped @ famous Ayappaya Temple and then came down to our final destination Kammanahalli Raj-kumar Park. We reached this place by 8:30am. 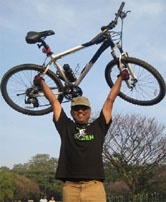 for snaps pls click on this link..
10 July 2011, Just after inaugurating Oberoi Hotel's bicycle parking, Today one more bicycling parking was inaugurated @ Lalbagh's South gate on 10 July, Go Green Group were supporting by participating in huge numbers. Honorable Urban Minister Mr. Suresh Kumar was the chief guest who inaugurated the bicycle parking stand. Our Bhaskar Rao was also present. This is one of its kind of Parking which would be made available most of the common places. .. for Snaps & more reports pls click here. 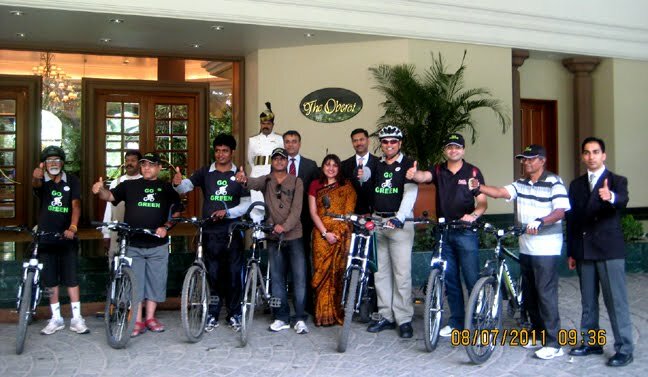 08 July 2011, GoGreen @ Hotel Oberoi 2 inaugurate Bicycle stands. GoGreen Group's Campaign Ride was towards Bangalore's Historic Tippu Sultan's Summer Palace, that is located in the heart of the city and close to K.R Market. 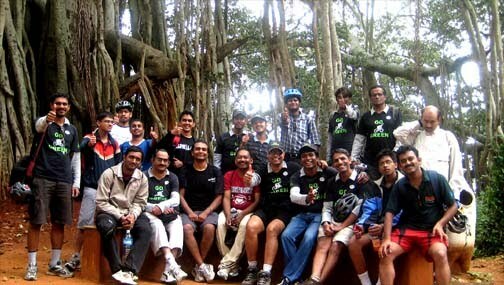 19June 2011, GoGreen Campaign Ride towards Bangalore Palace. 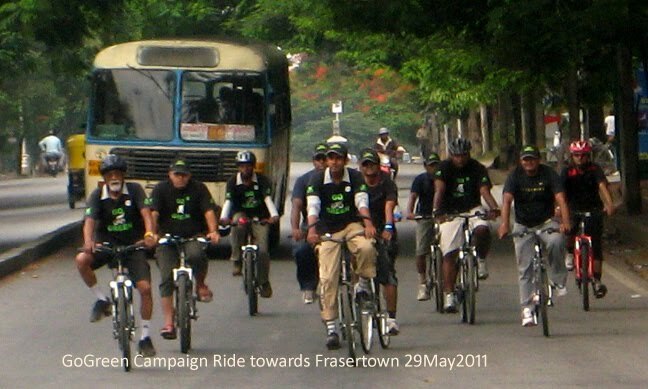 12 June 2011, GoGreen Campaign Ride towards Ulsoor Lake. June 5th World environmental Day Special Ride started from 4th Block Jaynagar shopping complex @ 7:00am. Around 40 GGI(GoGreen Initiator’s) along with Mr. Suresh Kumar Minister for Law, Urban Development participated in this event. Ride started @ 7:00am covering overall 40km, Starting from Jaynagar 4th Block through Minerva Circle – Town hall – Kempagowda bustand – Malleshwaram Mantri Mall - Sampage Road – Rajaji Nagar & reached Gayathri Devi Park where they planted trees inside the park. 28 GGI, Participated in this Campaign Ride "Say no to Fuel", Started from RIS junction went all along the Cubbon Park and back to GGR's house. 27 GGI's participated to support Manipal University Cyclothon that started from Kormangala 6th Block. Click here for more details & Event snaps..
18GGI's set out to Sakalavara Village which is off the Bannerghata Road and around 10km's from Jaynagar 5th Blk. Started the ride by 6:45am against 6:30am. most of them started joining on the way hence need to wait all along. finally reached the village by 8:00am where Mr. Vijay Kumar's from Rotary had organised a Cyclothon for Rotary members, starting from his farm. Mr M.N Suresh (Retd. District Governor) was there to flag of the event. 26 Mar 2011 Go Green team decided to have a special ride 2 show case their support 4 Earth hour day. Few volunteers from Earth-Hour were present @ the starting point to cover our event. 3 Cyclist Karthik, Naresh & Joesh came all the way from Indranagar and joined the ride. The Special Night Ride was really nice as the traffic had chocked all over and it was only we cyclist were able to move out of all the jams.. We have received couple of thumb’s up during the ride. Covered totally 36 Km's up and down. GoGreen Group along with Mr. Balagangadhar Chief officer from Karanataka State Pollution Control Board & Mr. Vijay Kumar Garuda Mall Center manager in their presence switched off almost 80% of the Malls lights and lit the candles. 20 Mar 2011 Go Green Endurance Ride..
20 Mar 2011 Go Green endurance ride towards Sarjapura Roads..
Celebrations @ ITC infotech park. 18 Mar 2011 Go Green team was invited by Tie-Earth hour for earth hour celebrations which was scheduled @ ITC Infotech park Banaswadi, Since it was a paid event hence we had restrictions on no of participants from our side. 5 GGI's participated for this event. Their was a press meet that was arranged @ 4:00pm where they gave us a slot to show case our GoGreen initiative. The main program started @ 6:45pm and went on till 8:45 followed by dinner. 13Mar 2011 Go Green Campaign Ride..
13 Mar 2011 Go Green Campaign Ride towards Malleshwaram. 6 Mar 2011 Go Green campaign Ride towards Ulsoor Lake was organised, 17 GGI's participated in this event, Started from RIS junction at 6:40am & reached Cubbon Park central library @ 7:20am where other GGI's were waiting. We had a guest who was all the way cycling from Mumbai with his message of Going Green. Click here for more details & Ride snaps..
20 Feb 2011 Go Green campaign Ride towards K.R Market & Avenue Road was organised, 15 GGI's participated in this event, Started from RIS junction at 6:40am & reached Cubbon Park central library @ 7:20am where other GGI's were waiting. We wanted to pass on a message of cheering our cricketer for wining over bangala desh. Their after we decided to visit K.R Market & Avenu Road. 14Feb 2011 Go Green Valentine Special..
Save money, Save Nature . 14 feb 2011 Go Green Valentine special day !! We planned to Gift our Valentien a special Gift from the money that we saved by cycling, 3 pairs from GGI-Group planned to meetup and show case the amount of saving that one could look into while you cycle and at the same time keep their spouse happy by gifting a Diamond Ring. 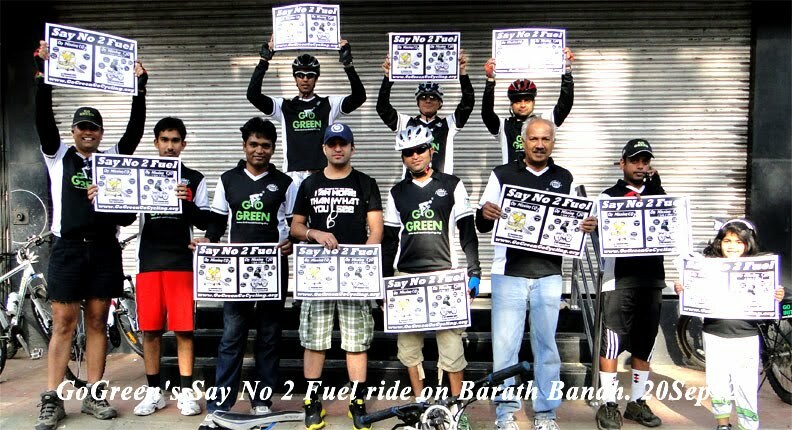 "Say No 2 Fuel "
A Special Campaign Ride ride was organised to show case people to Save on Fuel, GoGreen members conveyed to the fellow citizens to "Say no to Fuel 4 ever, Use Cycles and GoGreen" This ride was organised @ 5:00pm from Balbhavan where 17 GGI participated. South-GoGreen Group started from RIS junction @ 4:45pm and reached Cubbon Park's Bala Bhavan by 5:15pm where other GGI's from other regions were waiting. Ride started by 5:30pm and the following was the route we chosen. 2 flag off their Cyclothon. 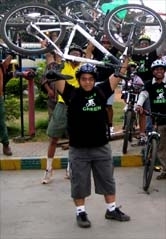 09 Feb 2011 Go Green Rao along with his group members were invited to Infosys Campus to participate in their Cyclothon. Hundreds of Infosys employees participated in the event. along with MS Ramaih Institute of Technology Students . A Special Ride ride along with MS Ramaiah Institute of Technology students was held on 06feb2011. South-GoGreen Group started from RIS junction @ 6:45am and reached Cubbon Park's Bala Bhavan by 7:25am where other GGI's along with students from MSRIT were waiting. Due some mis communications, the students Cycles didn't arrive hence need to wait. finely the Actual ride started @ 9:10am. 39 GGI's were present on today's ride along with 25 more cyclist from MSRIT + 10 to 15 volunteer students. For the First time Network 18 has honnered Go Green group for being the event partners hence the registration fee of Rs.300 was waived off for most of our partipaints. The GoGreen Team particpated in huge numbers @ this year's BSA Cyclothon 2011, 144 GGI, particpated in this event most of them were from South & East Bangalore. 16 January 2011 Sunday's Go Green support Ride..
16 Jan 2011 Sunday's Suppor ride. 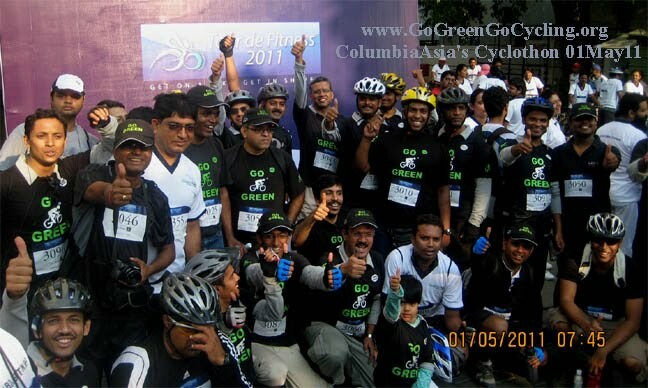 Go Green members supporting Achiever acadmey during a Cycling rally that was arranged for spreading the message of Green. MLA of jaynagar Mr. Vijay Kumar was present to flag off the ride. The ride started from Madhvan park by 8:30am and returned back touching Vidhana Saudha by 10:00am . Click here for more Snaps from this ride. 09 January 2011 Sunday's Go Green Campaign Ride.. Started Go Green Campaign RideRide @ 6:45am from RIS Junction towards BSK-II Stage. On the way we dropped @ Kanteerva Stadium where our Bangalore Cyclist was ready to set start for his Green-Ride from B'lore to Delhi.. Click here for more Snaps from this ride. An GGI-Endurance ride started from Merida Junction @ 6:30am on 19 Dec 2010, towards National Power training Institute located on 20th km of Kanakapur Road of Somanahalli. Totally 23 GGI Particpated in this ride. This is the only training center that is available in the whole of Asia .... Click here for more Snaps from this ride. Go Green Group along with IYCN had organised a Bathi Ride on 11 Dec 2010 to promote message of switching off the lights when not required. being working day for most of them hence 15 GGI members particpated. Started the ride from RIS junction @ 3:30pm and reached Cubbon Park's Queens Park by 4:00pm where we met other GGI's waiting for us. Click here for more Snaps from this ride. 05 Dec 2010 Sunday Go Green Team supporting the first Brevet ride. 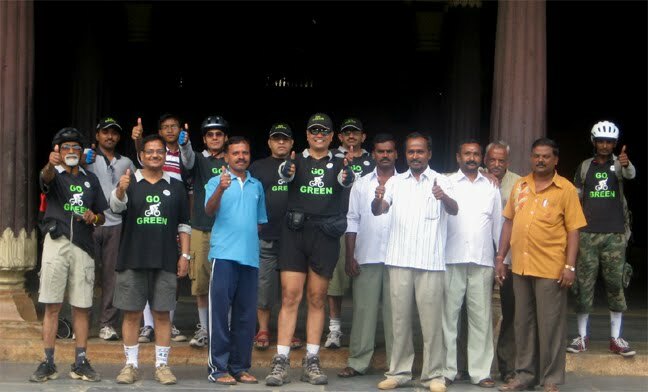 Go Green Group supporting the first Brevet trail run on 05Dec2010 by particpating in the event. 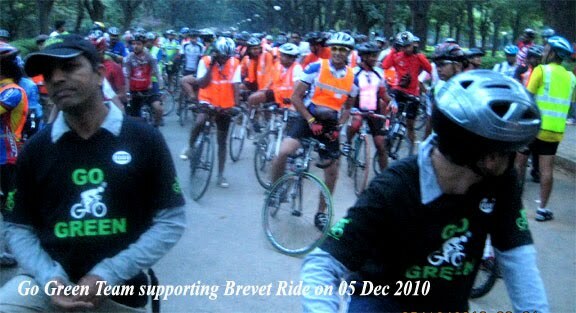 Bangalore Brevets launch had an inaugural 200km ride on December 5th, 2010! This ride is not ACP sanctioned, but a teaser for the actual 200km ride to come in January. Today’s ride also had 100 KM option. This was NOT a race, but a ride to enjoy the beauty of self sustained cycling - the goal is the distance and the journey and not how fast you do it. You don’t have a team and its all about how you sustain on longish rides like this. Click here for more Snaps from this ride.